Hi friend! September has been a busy month over here at Every Life Ministries and we have SUPER exciting things to share with you along with a GIVEAWAY! 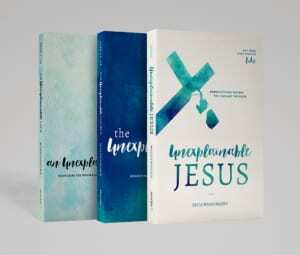 Many of you know I have been writing away on my next study, Unexplainable Jesus: Rediscovering the God You Thought You Knew, which will be an eight-week study covering the Gospel of Luke. My manuscript is due into Moody Publishers on November 15th and we will begin filming the video series in January on Tuesday mornings at Desert Springs Community Church. (I will send out the registration link to sign up after Christmas!) But the big news- and you all are the first to see it here- they have already designed the cover and I LOVE it! What do you all think?! The cover for my next book, The Unexplainable Jesus. My most favorite thing about writing Bible studies is the opportunity to go and speak to the groups who read them! This month, the LORD opened several opportunities for me to share and connect with others! I started out the month in Nashville at the Advanced Writer’s & Speaker’s Association where I was awarded Member of the Year. This was a complete surprise and I felt so honored to be recognized by a group of women which I esteem so highly! I was honored (and surprised) to be awarded AWS Member of the Year! That conference flowed right into the Christian Product Expo, where I got to visit Moody Radio Nashville, sign some books, and lead a workshop for bookstore owners and retailers about using Facebook Live to connect with their readers. We gave away some fun prizes and battled technology more than once! The following weekend took me to Prescott Pines Christian Camp where I led a workshop on Revitalizing Your Relationship with God. It was so great to connect with my friend and keynote, Debbie Alsdorf and my favorite place to serve is within my own church family, who coordinated the event through Southwest Church Connection. The month closed out with a local retreat with my second church home, Glendale Christian, leading a retreat entitled Thrive: Embrace Your Calling. The LORD was so good to meet us there and bring encouragement and equipping to so many of his daughters! The rest of 2018 will close with two trips to speak in Southern California and two more Christmas outreach Events here in the Phoenix area. Please pray for all of these events as I will be sharing the gospel! My speaking schedule is full through spring of 2019, but I am currently booking for Fall 2019 and Spring 2020! If you are looking for a speaking for your fall or spring events, please check out my speaking page on my website. You can fill out a contact form to request more information or you can also visit my Host Kit to find out more information and read my Statement of Faith. Most of my speaking engagements come through personal referrals, so if you have heard me speak or would like to recommend me, please consider sending the following info to your friend or women’s ministry leader! One of the things God has been driving home for me lately is the power of prayer. Powerful prayers produce practical results! I’ve compiled five powerful prayers to pray over your family and friends and I would love to share them with you! Have a friend who is going through some tough things relationally? Please feel free to pass this along to them! As I wrap up this next study, slide into the holidays, and reflect on 2018, I feel so tremendously grateful. I especially feel grateful for you- for taking this journey with me toward living an unexplainable life! I pray your year wraps up with a wonderful unfolding of God’s blessings upon your life.